Why learn to balance on two wheels when you don’t have to? I don’t remember exactly when I learned to ride a bicycle, but I’m pretty sure I was the last of my peers to acquire the skill. I have a vague notion that it wasn’t even necessarily my idea. Somehow we ended up borrowing an old and rusted girls’ bike with training wheels, a literal vehicle for shame and embarrassment. I knew that the whole world was watching me as I wobbled up and down the sidewalk. Ha, ha! Look at that kid who hasn’t learned how to ride a bike yet! I kept my head down, tried to keep my balance, and wondered how I had unwittingly fallen behind the rest of the pack. Like every childhood drama, it seemed terribly important at the time. My first experience with self-propelled vehicles was the classic tricycle, which by all accounts I heartily enjoyed. It was the standard, all-metal model with a runner between the back wheels. I am told that it was stolen from our front yard one night, a heartless thievery that I do not recall, yet I am willing to cast blame upon the anonymous robber for activating latent neuroses. If ever I am called to plead my case before a jury, I’m blaming whatever I did on the tricycle thief. I never had another metal tricycle, but sometime shortly afterward I became the proud owner of a Big Wheel, the definitive tricyclic transportation of my generation. With its ultra-low seat and right-wheel handbrake for spinning out, I had great confidence in the coolness of my ride. It made a wonderful noise as its hollow, plastic wheels sped across concrete, a sound so distinctive that my grandfather once claimed he always knew that Dad and I were coming around the block for a visit when he heard the distant rumbling of my Big Wheel. I was perfectly happy with it, but there did come a day when I was physically too big for it. Marx Toys, maker of the Big Wheel, was ready to meet my needs, ready with a product that was to the Big Wheel what the Big Wheel was to old-school tricycles. The Green Machine was a beautifully engineered contraption of elegant design. A recumbent tricycle with a bucket seat, it featured a broad axle in the back and a simulated mag wheel up front. It looked really sleek. 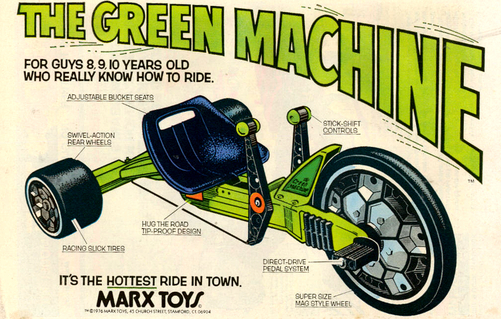 But the coolest thing about a Green Machine was its absence of a steering wheel. In its place was a pair of side-mounted, stick-shift controls, which rotated the rear axle. Pull the left control back while pushing the right control forward, and you would turn left. Shift in the other direction to turn right. Although the pedals were fixed to the front wheel just like a Big Wheel, the rear-steering mechanism of the Green Machine meant that its front wheel was always straight as the plastic chassis. Consequently, one never had to deal with the annoying variation in pedal distance that accompanied every Big Wheel turn. Oh, how I loved my Green Machine. Taking it out for a spin was the purest of joys. Sitting so close to the ground while getting the most out of its efficient drive design gave a thrilling illusion of speed. Its left-right shifters allowed an economy of motion that could not be afforded by a steering wheel. Truly, the Green Machine returned maximum locomotion for a minimal investment of effort. For someone like myself, a natural adherent to paths of least resistance, it was a blissful marriage. I was comfortable. I was cool. I was one with my Green Machine. Since the distant days of the ancient book of Ecclesiastes, mankind has noted the transitory nature of all things, whether painful or pleasurable. “To everything there is a season,” wrote its author and much later sang The Byrds, and all the turn-turn-turning of that front wheel, albeit never to the left nor right, eventually took its toll. There is only so much stress that plastic can endure. My last ride on a Green Machine came to a rolling halt immediately after I felt a strange lack of resistance in the pedals. Suddenly my legs were pumping like crazy, yet I was decelerating. The shaft of the pedal assembly had broken loose from the wheel’s worn core. It was a devastating impotence. Dad knew how much I loved the Green Machine and did everything he could to restore its operability, but the strongest compounds he applied could not withstand the force of pedaling. At that point, I don’t even know that you could buy a Green Machine anymore, just as Big Wheels were disappearing from toy department shelves. Nor were replacement parts available. Alas, not with a bang but a whimper, my Green Machine was totaled. As with my stolen tricycle and outgrown Big Wheel, it was time to move on, whether I wanted to or not. Surely I knew how to ride a bike by the time my Green Machine died? I would like to think so, yet the chronology is hopelessly jumbled in my mind. It is quite possible that I failed to learn this basic skill simply because I didn’t have to. Really, with the comfort of a cool, recumbent tricycle at one’s disposal, who needs to bother learning how to balance on two wheels? Having no other choice, I had to conquer my ineptitude. And believe me, riding a rusty girls’ bike with training wheels is a strong motivator, so strong that I barely recall the learning process. One day I couldn’t ride a bike, and then one day I could. Or at least that’s all I remember. Perhaps I’ve repressed the struggle. But I do remember my Green Machine. I know the exhilaration of neighbor’s lawns whizzing by and the roar of the wind in my ears. I can still feel the rear axle responding to my grip on the stick-shift controls. I can summon vestiges of the pure joy I experienced speeding along as the sun set on many a summer evening. And the child inside me, for better or worse never far away, still hopes that one day he’ll ride again.